Malachite is an intense green colored, copper carbonate mineral. Instead of being a solid color, it is often banded in shades of green. While it can form tabular and twinned crystals, it is more often seen as botryoidal masses, or stalactitic, with a fibrous banded structure or crusts. Malachite can commonly be found with azurite. It has a hardness of 3.5-4 – soft enough to carve readily, yet still taking a polish. The stone is used for decoration, ornamentation, and jewelry. It can also be crushed and made into a green pigment. It was originally worn to ward off evil spirits. Brazil, and Arizona. It was named after the Greek word “mallows”, alluding to its leafy green color. It has also been called Atlas ore and Green Copper. Pellant, Chris. Rocks and Minerals. New York: Dorling Kindersley, 1992. Print. Pg. 105. This entry was posted in The Conglomerate and tagged gem, green, malachite, mineral, rock, stone on November 20, 2015 by NDrockclub. 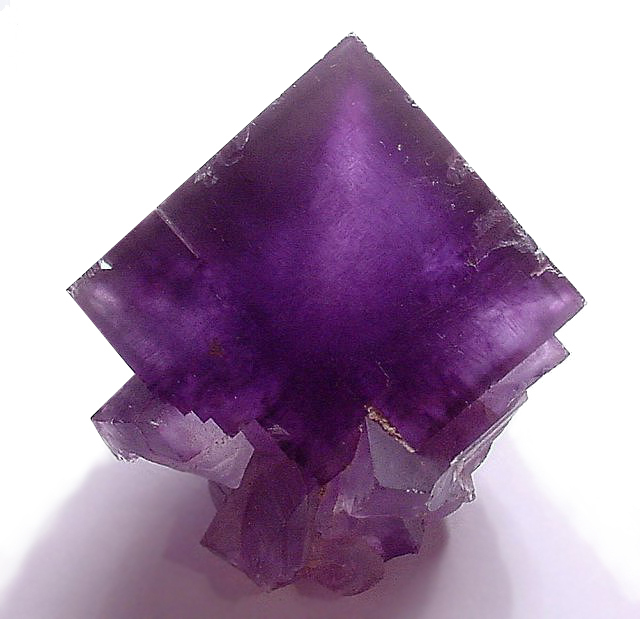 Amethyst is a purple variant of quartz (yellow = citrine, green = prasiolite), with its color coming from iron impurities. Its name comes from the Greek “a-“ (not) and “methystos” (intoxicated), stemming from the belief that the stone protected against intoxication. It was also thought that the stone would make a person more clear-headed. Amethyst can be found world-wide, with large deposits found in Brazil, South Korea, Austria, Russia, and numerous other countries. Before large deposits were found, this stone used to be lumped with diamonds, rubies, and sapphires for its rarity and preciousness. With a hardness of 7 on the Mohs scale, it makes a good gemstone – fortunate, as it is the birthstone for February. Cutting the stone properly can be challenging. 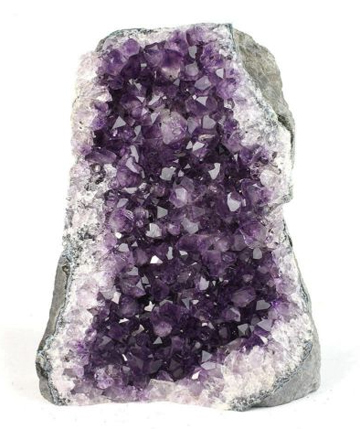 The crystals do not often have a uniform concentration of color, but vary in shades of purple and mauve. These crystals are often found in geodes – some of which are massive in size. Kunz, George F. The Curious Lore of Precious Stones. New York City: Halcyon House, Blue Ribbon, 1930. Print. This entry was posted in The Conglomerate and tagged amethyst, birthstone, crystal, february, gem, purple on February 3, 2015 by NDrockclub. 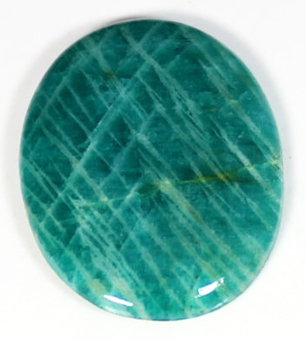 Amazonite, also called amazonstone, is a type of microcline feldspar which is translucent to opaque blue-green in color. It was named in 1847 by Johann Friedrich August Breithaupt. Even though the name implies a locality close to the Amazon, no deposits have yet been found nearby. Instead, it has been found in Ontario, Quebec, Italy, Russia, and Colorado. The color comes from traces of lead, not copper. If used as a gemstone, it is generally cut into a cabochon due to its fragile nature. It has a hardness of 6-6.5 on the Mohs scale. 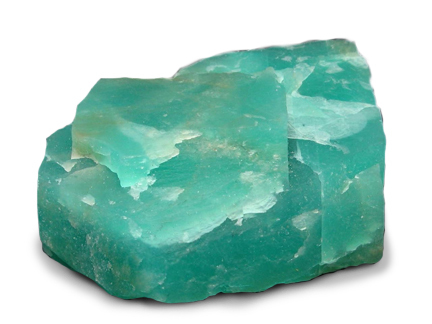 The chemical formula for Amazonite is KAlSi3O8. This entry was posted in The Conglomerate and tagged amazonite, gem, mineral, stone on January 26, 2015 by NDrockclub. Ammolite is both fossil and gemstone. It comes from the aragonite mother-of-pearl surrounding ammonites – jokingly called “grandmother-pearl”. 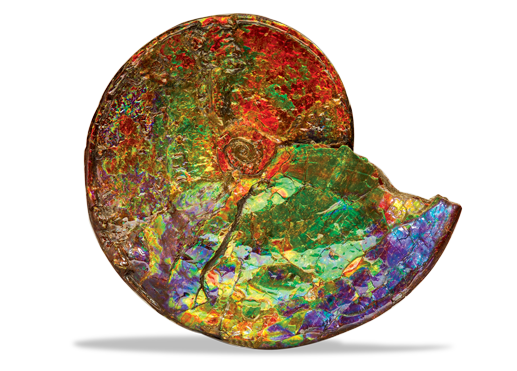 Many ammonites still exhibit an iridescent sheen to them, however the ones from mines in southern Alberta exhibit a rainbow spectrum of gem-quality colors. Aragonite in life is an unstable organic crystal form of carbonate, and generally when a shell fossilizes, as it’s already a mineral, simply reverts to a more stable form of calcite. With Ammolite, the aragonite layers haven’t reverted – and the more layers there are, the more colors are refracted. It was given gem status in 1981 by the World Jewelry Confederation. It is one of three organic gemstones – the other two being amber and pearls. If used in jewelry, because of the soft nature of the stone (only a 3.5-4 on the Mohs scale), it should only be set in earrings or pendants – not rings. This entry was posted in The Conglomerate and tagged ammolite, ammonite, fossil, gem on December 17, 2014 by NDrockclub. Group: Halide. Chemical formula is CaF2. 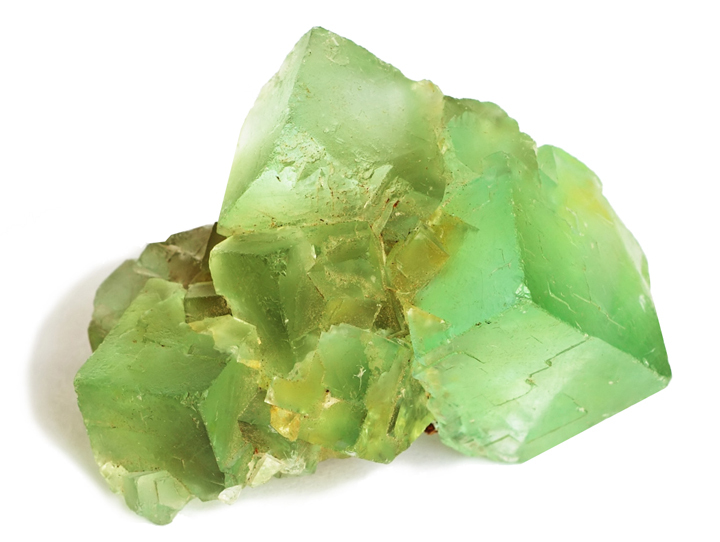 Fluorite is a translucent mineral that covers a rainbow of colors, yet has a clear streak. The crystal structure is cubic to octahedral, often with twinning. Like chalcopyrite, fluorite is found in hydrothermic veins, and hot springs, often alongside sulfides. It is fluorescent under ultraviolet light. The mineral has been used as lenses in telescopes and microscopes, a flux for smelting, and even as a source of fluoride for hydrofluoric acid. It was named in 1797 by Carlo Antonio Geleani Napione, from Latin – “fluor” meaning stream, or to flow – for its use as a flux. Fluorspar is also a common name. Fluorite is also used in carving and jewelry, however with a hardness of 4 on the Mohs scale, heavy wear is not recommended. Pellant, Chris. Rocks And Minerals. New York, Dorling Kindersley, Inc., 2000. Pg 74. This entry was posted in The Conglomerate and tagged fluorescent, fluorite, gem, mineral on December 11, 2014 by NDrockclub. Discovered in 1967 in Tanzania, tanzanite (named by Tiffany & Co.) is one of the more recent birthstones for December (as of 2002, via the American Gem Trade Association). While the stone may be light violet in some cases, darker shades of periwinkle with hints of purple are sought after for higher gem quality. A blue variety of the gemstone zoisite, tanzanite has a Mohs harness of 6.5-7 – not particularly tough for a gemstone. Corundum (rubies and sapphires) sit at a healthy 9.0 on the Mohs scale. 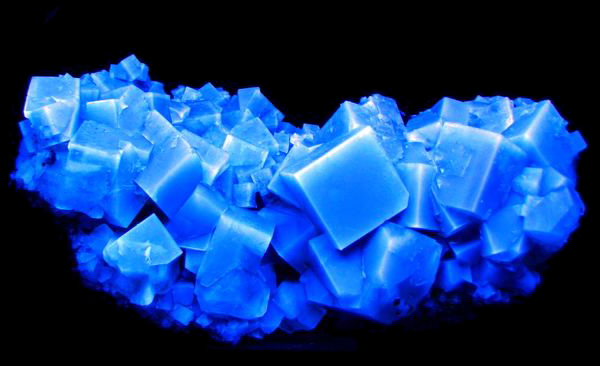 The blue color is caused by trace amounts of vanadium within the ziosite – much like trace elements can also cause various colors of diamonds. The blue can be enhanced and brought out in the stone by careful addition of heat. Tanzanite crystals are also pleochroic – meaning from different angles they exhibit different colors. The same crystal from one direction may look blue, and another direction look red or brown – thus faceting the stone can be challenging. Newman, Renee. Exotic Gems: How to Identify and Buy Tanzanite, Ammolite, Rhodochrosite, Zultanite, Moonstone & Other Feldspars. International Jewelry Publications, 2010. This entry was posted in The Conglomerate and tagged birthstone, december, gem, stone, tanzanite on November 30, 2014 by NDrockclub.